Amazing gardens and white sand beaches are just steps off of your patio at Nutmeg Villa. With your own private plunge pool and activities like water-skiing or wave runners nearby, there’s no shortage of things to do. The beach is minutes away, and there’s a housekeeper and cook at the villa who will take care of three meals a day. This is the place to relax and unwind on the Platinum Coast! 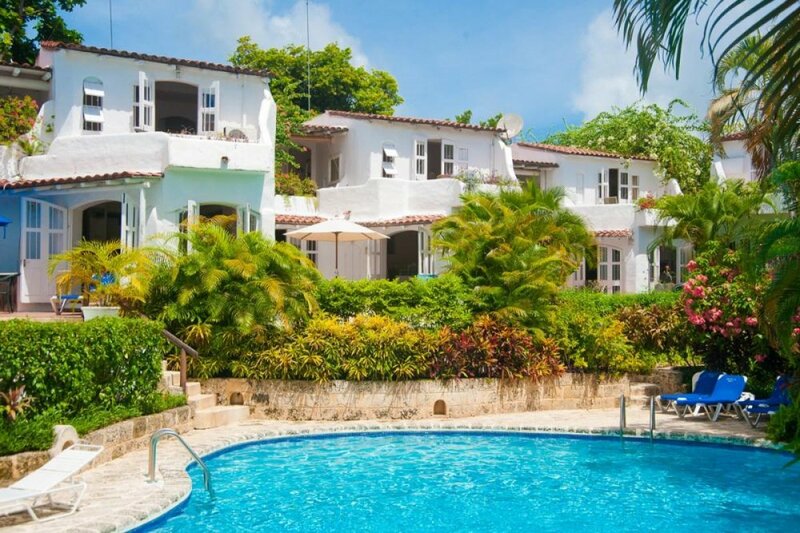 Nutmeg is a three-bedroom beachfront villa in the Merlin Bay community on the Platinum Coast of Barbados. Staffed with a cook and a housekeeper, it’s easy to relax at this tropical getaway. Lush landscaping surrounds the plunge pool and coral deck, and a set of steps lead down to a secluded white sand beach. Nutmeg’s upper level dining terrace is decorated with a hand-painted mural and features ocean views. Merlin Bay also has a large community pool where guests can swim laps or sunbathe. The indoor dining room seats 6, and the sunken sitting area opens to the plunge pool. The kitchen offers wraparound countertops and stainless steel appliances, including a blender, French press, and gas stove. Each of the three bedrooms offer an ensuite bathroom. Two of the suites have king beds and balcony access, while the third has two twin beds that can convert into a king. Nutmeg is centrally located between Speightstown and Holetown, so restaurants and water sports are minutes away. The Platinum Coast is a hub of activity where guests can find several shops, excursions, and dining options. Plunge pool 14ft 6in x 11ft 6in, 4ft 6in deep. Resort pool 70ft x 30ft, 4ft at shallow end and 7ft at deep end. We rented Nutmeg for one week in May. The villa is perfect, lovely decorated. We have 4 young kids, it was big enough. The housekeeper, Marion is very nice, and so sweet! We had a wonderful cook too, Adamna. It made a big difference having both of them to help in the house, well basically doing everything! The villa was spotless, nothing broken down. The view from upstairs, the master bedroom, and an other bedroom, absolutely beautiful. The plunge pool is big. we felt our terrace, in front of the living room, was private. Nice view on the pool, and we could see the sea. not as much as the front villas, but still, we can see it. The pool is big and very clean. The garden is stunning. The beach is perfect, we could walk easily in 15 mns, only on one side. The other one you can’t because of big rocks, kind of small cliffs, on this side it’s the Fairmont hotel beach, juju’s beach bar. In front of the villas, there is lots of reef, great for snorkeling, and there is a big sandy area, to go in the sea. Nice trees, coconut trees, flowers etc. In a heartbeat we would rent again!! Once there, one of the villas manager visited us, to make sure everything was alright.